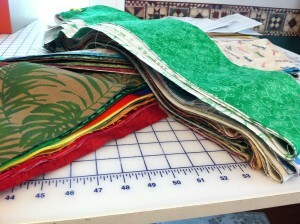 The Chapel at Carleton College is looking for proposals from fabric artists for a new set of banners. My friend the Rev. Carolyn Fure-Slocum has asked me to help get the word out. Thanks to everyone who came to my booth at the United Church of Christ General Synod — and especially to those who went home with stoles. It was wonderful to meet so many new people, and to share my love of beautiful fabrics that can enhance and enrich worship. 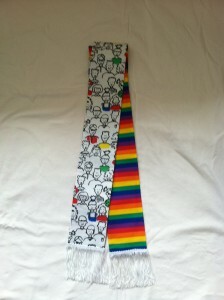 Today I updated my Etsy Store (click the button on this page to find it) with more stoles — mostly green and red. 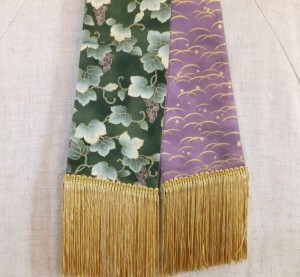 The one pictured here is made from a stunning Asian-themed fabric with stylized grapes, leaves, and vines. 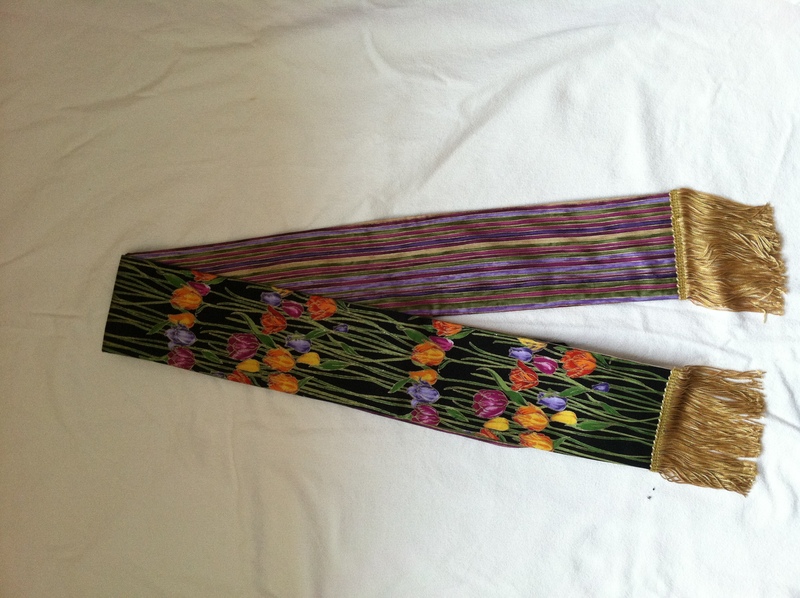 The beautiful purple on the reverse side makes it two stoles in one (all my stoles are fully reversible). I hope you will come and look! 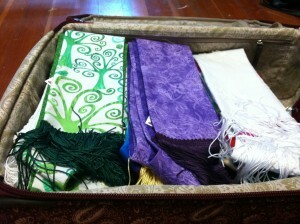 I am busy packing to go to the UCC General Synod in Long Beach, California. For the first time, I will have a booth in the Exhibit area .. booth #461. I met my goal of making 100 stoles for the booth. Which means (for those who are interested), 66 yards of interfacing, nearly 2 km of beige thread (for most of the sewing), 50 yards of rayon fringe, 75 yards of beautiful fabric, and more hours than I am willing to confess! See you in Long Beach — and tell your friends! As you will read in a moment, I am on my way to the UCC General Synod in Long Beach, California. That means I won’t be adding anything to my Etsy shop until mid-July at the earliest. if you need something before that, please contact me! 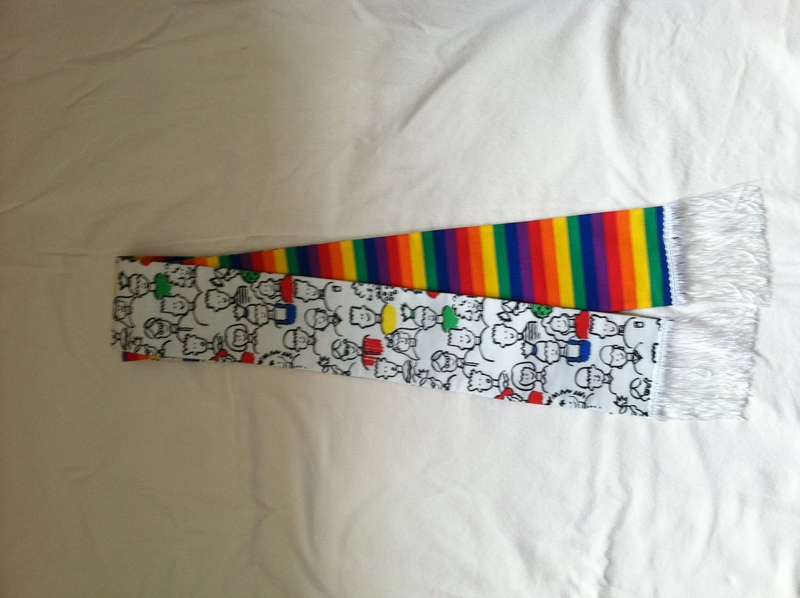 Another non-traditional stole — this one celebrating particular ministries: children and youth on one side (those are the smiling faces) and welcome to GLBTQ folks on the other (rainbows). This is one of the stoles I am taking to Berkeley for next week’s Earl Lectures. If you are going to be there, stop and say hello. If you have west coast clergy friends who might be attending, tell them to look for me! The fabric in this stole doesn’t match any of the traditional colors of the church year. But these bright tulips — with flecks of gold in them — certainly bring a message of joy and new life. 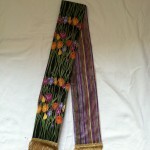 The stripes on the back might qualify as a purple stole, if you really needed to have one. The congregation spends a good bit of the service watching the minister. It is not frivolous to be intentional about what they will be looking at — hopefully something that deepens and enriches the experience of being in worship.